It is based on the top-spec VX variant and is available with both petrol-manual and diesel-manual powertrains. 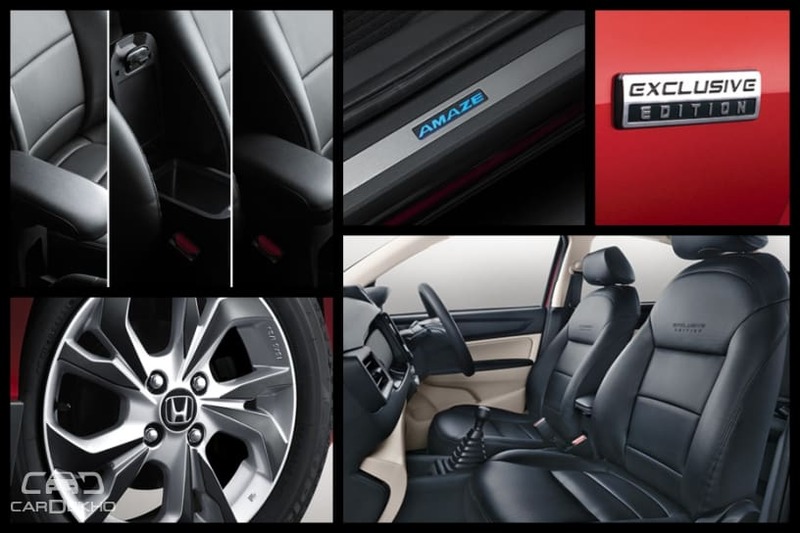 Honda has introduced a new limited edition variant of its best selling sedan, the Amaze. Called the Exclusive edition, it is priced at 7.87 lakh and 8.97 lakh (ex-showroom Delhi) for petrol-MT and diesel-MT, respectively. The Amaze Exclusive edition attracts a premium of Rs 13,000 over the VX variant, on which it’s based. Though the premium for the additional features on offer is on the higher side, it does make the car stand out from the regular version. Other features on the Exclusive edition are similar to the VX variant. And hence, you get dual front airbags, ABS with EBD, ISOFIX child seat anchors, auto AC, cruise control, push-button start, parking sensors with camera and a 7-inch touchscreen infotainment system with Apple CarPlay and Android Auto. Mechanically, the Amaze Exclusive edition carries forward the 1.2-litre petrol and 1.5-litre diesel engine of the regular model. While the petrol engine makes 90PS of power and 110Nm of peak torque, the diesel engine is good for 100PS and 200Nm. Both the engines are mated to a 5-speed MT. The Honda Amaze rivals the likes of the Maruti Suzuki Dzire, Hyundai Xcent, Ford Aspire and VW Ameo in India. Prices for the Amaze range start at Rs 5.86 lakh (ex-showroom Delhi). It is available with an automatic transmission as well, with both the engines, in S and V variants.